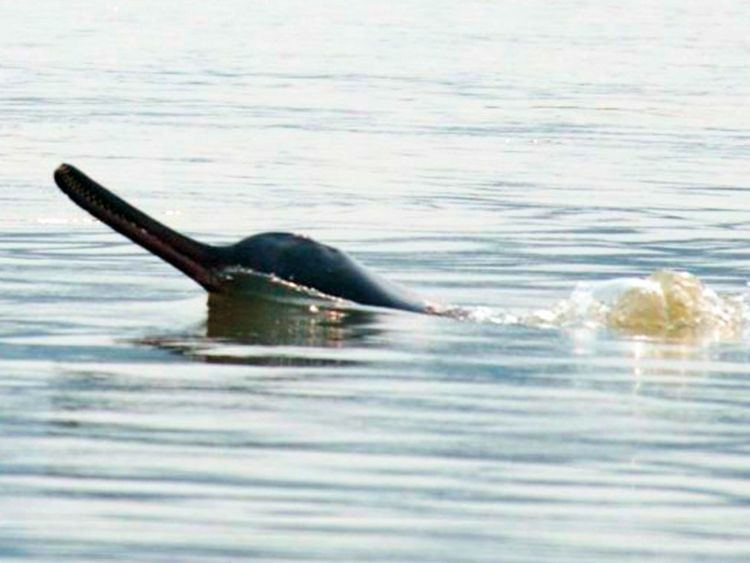 Kolkata: India’s national aquatic animal, the endangered Gangetic river dolphin (Platanista gangetica gangetica), is rarely visible in the waterways of the Indian Sundarbans. And now a new study has shed light on the rise in salinity in the water and blamed reduced freshwater flow for the mammals’ disappearance in the iconic estuarine habitat. The mammals keep away from the central Sundarbans, the survey found, where siltation in the waterways has disrupted freshwater flow, leading to high salinity levels. “Gangetic dolphins are obligatory freshwater animals and they never enter the sea. They are found in brackish water zones such those in the Sundarbans estuary. But freshwater flow has declined over the decades and seawater has ingressed, increasing the salinity. They are rarely visible now, whereas once they were plenty,” Sinha, Vice Chancellor Nalanda Open University, told Mongabay-India. Records dating to 1879 reveal the freshwater-loving mammals swam along the entire length of the Ganga and Brahmaputra rivers, and all their tributaries from the delta at the Bay of Bengal till the Himalayan foothills. Even in the month of May, when the Ganga was very low, dolphins were seen as far up the Yamuna in Delhi.